David Cameron’s approach to reducing inequality has come under attack from respected academics, cited by Mr Cameron, in the week that his use of poverty statistics were questioned for their accuracy. “Bringing down the top incomes is very important. Cameron talks about social problems and diminishing responsibility as if they came from too much government. 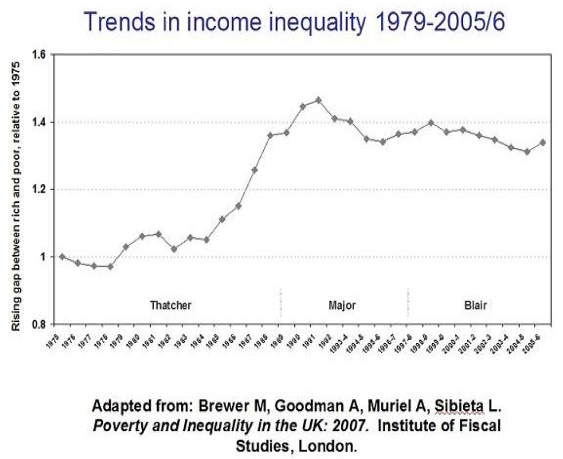 I think these are the long-term consequences of the rise of inequalities under Thatcher. Wilkinson and Pickett’s book ‘The Spirit Level‘ published earlier this year shows that countries with low inequality and good social capital also have big states. Frame 7 of a slideshow on their website show that ‘smaller state’ countries like the US and UK did worse than big states, for example in Scandinavia, where government action reduces inequality and fosters higher levels of social capital than in Anglo-Saxon states. This is not to apologise for Labour’s lack of progress on inquality. Wilkinson and Pickett will be calling on all parties to address inequality as the main cause of social ills. Now is the time for Labour to make a commitment to a less unequal society rather than kowtowing to the city. But cross-dressing Cameron is now being exposed as the wannabe emperor with no clothes. Not really sure what is achieved by leveling down. Doesn’t help the poor. 1) Wilkinson and Pickett show how income inequality and social outcomes are closely correlated. 2) Cameron shouldn’t cite them if he doesn’t accept their conclusions. You’re wrong, Guido. You need to read Wilkinson and Pickett. We are social beings. There IS such a thing as society. That is why inequality matters. http://bit.ly/1nO2BV Relative poverty is what matters. Find out more! You should be levelled down guido. @ToryatSea http://bit.ly/3E4LE4 It's hardly a brilliant record, I know. But I'm not sure inequality has increased much, if at all. Levelling down is painful in societies with competitiveness (which is culturally modified aggression – like it or not) as an exclusive criterion of social promotion. The inter strata barriers grow higher. The degree of anxiety and aggression accompany them. A the thoughtful move from the top to level it down a bit seems to be the best solution – you don’t have to look too far for other solution – deprivation and decline. Most of the middle class understands that it is the lower class pushing with their (considered unsubstantiated although they are not) claims that robs them of their money. Most of our mass media play it exactly this way, exacerbating the problem. I can see the point in reluctance to give money to people who seem not to know better but the roughest ways of using them. You can not throw the money at people from helicopters (…). You can not soak the economy with the money like a sponge – you have to work at pains to built a structure that absorbs the money without destroying own ability to consume (and to produce and in this order – why do so many of you think that we produce to fight to find somebody to consume it than, why are we so far from the primitive notion of : I need an apple; I get a stick; I pick the apple to eat it and to share it! What are the simplest steps you can take? They are very basic indeed: go the the pub across the road you never went to and talk to people (and put an unbranded simple jacket on). The real measure of poverty is how much you can give away without harm? Think for yourself – if you consider yourself not well enough to give away a penny, whatever your wealth, you are a pauper.